Australia Post has chosen Google Cloud to power its enterprise data analytics platform. “We are one of Australia’s most trusted organisations, and we don’t take that trust for granted. Our customers are more sophisticated and empowered than ever. They want choice, control and convenience in how, when and where they access our services,” John Cox, CIO, Australia Post said. According to the company, the results of moving to Google Cloud has been transformational in just a few months. BigQuery has given Australia Post visibility into every stage of the mail delivery process and helps its teams make decisions faster. The amount of time it takes to perform analytics has been reduced by a factor of 10, including how long it takes to use visualisation-intensive business intelligence applications, such as Tableau. This means operation managers can now see what’s happening in sorting facilities in real time, helping to identify flow blockages almost instantly. Previously, these types of insights would only be available at the end of the day, but now they’re delivered within 15 seconds—that’s 300 times faster. “The need to transform and embrace data has been huge for us over the last decade, so partnering with Google Cloud was an easy choice for us. With near real-time data analytics, we can free up valuable resources, act quicker and provide better service to the millions of Australians that rely on us every day. We are planning on using machine learning to identify ways to save customers time and give them more certainty about their delivery choices, and we look forward to seeing that unfold,” John said. Australia Post plans to continue exploring BigQuery. 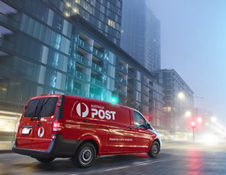 We look forward to seeing how Australia Post delivers for its customers in the years to come.